I want to talk to you about a mystery. An interesting and important mystery. One that is, well, a matter of life and death. And what has this extraordinary zine, The Horror Zine, got to do with that extraordinary mystery? Because the zine that you are reading is part of a unique gift that we enjoy as a species. That gift is ‘story.’ As far as we know, we are the only creatures to tell, invent, and enjoy stories. And stories are important. We owe our existence to them. They sustain. Interpret. Educate. Encourage. Give hope. They allow us to see through the eyes of our fellow humans. They nourish empathy. Stories develop the strength and breadth of our amazing imaginations. They give us the power, from time to time, to cheat death. They are vitally important to the human race. Stories mean life. Many anthropologists will cite singing and dancing as being the glue that cemented early tribal society together. I believe our ‘species survival and growth package’ includes other vitally important elements, such as a talent for the visual arts, a compulsion for physical and mental games, and stories—our universal passion for the made-up tale. Fiction pumps through our veins. Where’s the origin of this apparent inborn need to tell and to hear stories? The mystery lies in the origins of this need. We can’t say precisely where the first fable was spun. Or when. Perhaps a gene mutated in one of our ancestors two hundred thousand years ago. For some mysterious reason our great (many times great!) grandmother or grandfather found themselves saying words that broadly mean “Once upon a time.” And then relating events that never actually happened, yet which contain iridescent truths that illuminate human life. Now I should say something about my dramatic statement that stories are so important we owe our existence to them. After all, I can’t glibly toss out the opinion “that stories are a matter of life and death” in your general direction, then saunter away, can I? So, Ladies and Gentlemen of the jury, I present my case. The facts are, at the time of this writing, scientifically accurate. Of course, I’m a writer of fiction (every cell of my body positively throbs with that ‘story’ gene: yours, too! ), so I paint my facts onto the canvas of imagination. Here we go. We’re traveling back twenty thousand years. Back to a world of woolly mammoth and saber-toothed cats. Silently, we follow a lone figure limping through the forest. This is the last of the Neanderthals. The anatomy of the figure is typical of the Neanderthal species. A very stocky build. Sturdy legs. The jaw juts out fiercely. Large eyes peer from beneath prominent brow ridges. The arms are muscular, biceps are bulging. She is so powerful that she can easily snap the neck of a wild pig. Her body language radiates confidence and strength. Her formidable torso is protected by a long cloak made from reindeer hides. She carries a spear tipped with a flint that’s as sharp as a surgeon’s scalpel. For months she has been searching for more of her kind. A quest doomed to failure. She can’t possibly know that she is the last of her species. Nor would she understand that something happened in the last few generations that caused the Neanderthal to begin a headlong rush to extinction. The last Neanderthal is living on borrowed time. In the forest she hears voices. Though the language is unfamiliar, she is suddenly excited. Her species have communicated with each other in a remarkably sophisticated way for thousands of years, using spoken words and tongue clicks. Her heart pounds. This female is certain she has found another family grouping of Neanderthals. The chances of joining the group are slim—typically Neanderthal tribes are insular, they seldom interact—just the thought, however, of setting eyes on her own kind is so thrilling that she begins to run. At the edge of the clearing the female pauses. Something is wrong. Yes, the men, women and children she sees walk on two legs, they call to one another, a couple are arguing, juveniles are laughing as they throw sticks into a tree. The figures wear animal skins, carry spears that are remarkably similar to the weapon she carries. Yet they are not the same as her species. Their bodies are so slender they seem almost fragile. Their faces are peculiar, too. They have small chins; the foreheads rise straight up instead of sloping back like those of her race. The last Neanderthal is disappointed. These aren’t of her blood. Yet she finds their behavior interesting. Although it is decidedly bizarre. Not much of it makes sense to her. Lack of food has made her drowsy. So why not settle down here in the bushes? Rest. Observe these delicate creatures for a while. From her vantage point, concealed in the vegetation, she watches. The peculiar-looking creatures start a fire. They butcher a roe deer with flint knives. Soon they are enjoying a meal. Even though they have been hunting during the day they don’t doze after the feast like Neanderthal hunters would do. These eccentric individuals chase one another about the camp. The young men make a competitive game of jumping over a rock. Meanwhile, a group of children scratch lines in the dirt with twigs. She realizes that the lines resemble horses. This is very perplexing because her own species never did anything like this. Nor did they carve figures as a man appears to be doing right now to section of mammoth tusk. Just as darkness pulls in, when all sensible Neanderthals would be bedding down for the night, these people start to move about the fire. They clap their hands in a rhythmic way. Sounds come from their delicate, little mouths. They seem to be saying the same words at the same time, then they begin to sway to the rhythm. Song never featured in the Neanderthal way of life. Dance is alien to her. After the dancing a silver-haired woman begins to speak. All the tribe gather round to listen. They are captivated by what she is saying. The last Neanderthal notices the expressions on the faces in the audience. She’s incapable of figuring out that the Homo sapiens are listening to invented situations that befall a fictional character. And because other tribes of Homo sapiens are eager for new stories, different tribes meet and share their fables. Therefore, they don’t experience the tribal isolation that has brought the socially shy Neanderthal to the brink of extinction. The family group she watches from her hiding are vibrant, outgoing, and passionately interested in life. Their restless curiosity always means that they expand their contact amongst neighboring tribes, so the gene pool is ever-growing. These highly imaginative humans are equipped to survive, even flourish. The female stares at the creatures listening to the story. The faces of the children shine with delight. They are learning without even realizing a lesson is being taught. Or that the muscles of imagination are being strengthened to the point imagination becomes a tool of incredible power in its own right. The last Neanderthal continues to stare as the stars come out one by one. She no longer blinks. Not even when a spider begins to methodically spin a pure white shroud for her face. Story. So very important. So vital to the survival of our species. And fiction is important to us individually. You probably remember the first story you heard that fascinated you, and invoked the power of your imagination. Certain films and TV dramas undoubtedly still linger in your mind, even though you saw them as a very young child. I grew up loving movies that featured monsters, aliens, and robots. When I was three-years-old I watched a film on television that, for the first time, seemed to light up the atoms of my very being. For the life of me, I can’t name the film, or the actors. But, wow! I can still remember the hulking, great robot that stomped down a metal ramp with so much force that sparks flew from its iron feet. Bouncing up and down on the sofa, I shouted, “That’s great! I’m going to watch it again next week!” The adults carefully explained to the diminutive Simon, with his wide, shining eyes, that it was a film, not a TV series. That it wouldn’t be back next week. That didn’t matter. Not at all! Because my imagination had been brought to life. Whenever I wanted, I could recall in vivid, dazzling, awesome detail that huge robot clumping along, sparks blazing from its feet. So, like my fellow human beings everywhere on Earth, I found my love of story. Books, comics, television, film, radio. Stories pulsated everywhere. My family told tall tales. My uncles had a never-ending supply of haunted house yarns. “Simon. Do you see that house by the canal? There are ghosts in there…” An uncle would point to the creepy old building and I’d believe every word. Fiction nourished me as much as potatoes, gravy and the sweet puddings we were served at school. What I devoured most in the way of books were anthologies. Fortunately, the school library had a fine stock of ghost stories for children. I gobbled them up one after another. And birthdays brought me the Armada Ghost Book series. And it was only later that I appreciated that many of the pieces I enjoyed were first printed in magazines, such as the nineteenth century monthly The Strand Magazine, and Weird Tales, hailing from the 1920s. These publications used the latest print technology to deliver their content in what was then a fresh and inventive way. The Strand Magazine not only published great text by the likes of Sir Arthur Conan Doyle, there were also dramatic illustrations of soldiers brandishing swords, or explosions, or thrilling cliff-top fights. Weird Tales boasted vivid covers, which were broadly on the Beauty and the Beast theme. Gorgeous females being menaced by alien creatures were a resounding favorite. Back in the gloomy depression between the World Wars they would have screamed excitement from the newsstands. Buy Me! I can take you away from your worries! Readers would be carried away on strange adventures from the pens of H.P Lovecraft, Robert E. Howard and the top pulp writers of the day. Imaginations would blaze; the reader would step into the hero’s shoes. They’d be empowered. Even when the reader was back in the real world again after closing the magazine, they could face the day-to-day struggles with renewed energy and hope. That’s what stories, do. They help our species to survive. 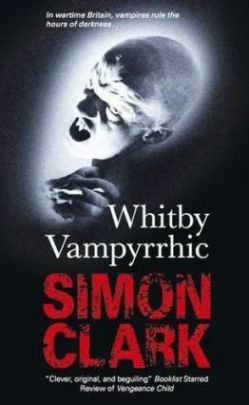 Simon’s latest novel is a return to the much-loved Vampyrrhic mythology with Whitby Vampyrrhic. 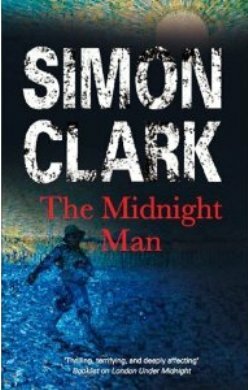 He has also recently published The Midnight Man, a story of murder, madness and ghosts, featuring Vincent Van Gogh in the most turbulent year of his life; and Ghost Monster, about opening graves in a cemetery for an archaeological dig. 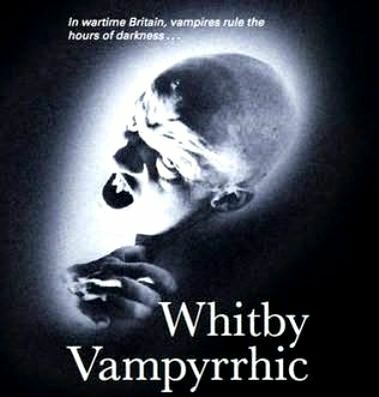 Whitby Vampyrrhic is now available in paperback HERE. 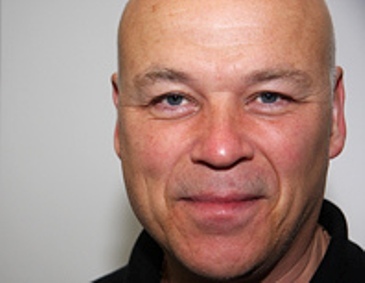 Peter Coleborn has edited various publications for the British Fantasy Society including Chills and Dark Horizons. He has held several posts on the society's committee including chair and organiser of the annual British Fantasy Convention -- when he can be seen carrying around his various SLR cameras. 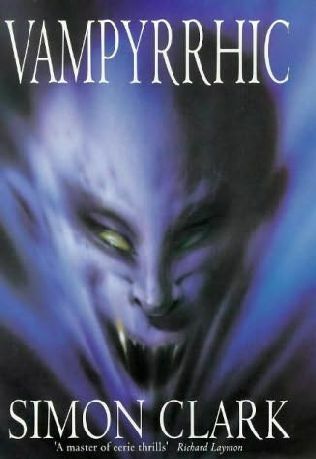 He also ran the small press Alchemy Press, publishing a number of titles including the award-winning Where the Bodies are Buried by Kim Newman. The Alchemy Press has just launched a new online magazine, Wild Stacks (see our List of Zines Page). His photos have appeared in Locus and Prince of Stories: The Many Worlds of Neil Gaiman (by Wagner, Golden & Bissette) amongst other titles. Examples of his work can be found HERE. 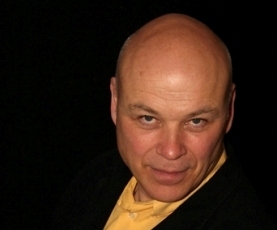 The photo of Simon on our home page was taken at the British Fantasy Convention (Fantasycon) in 2008, and that on this page (the one with the black background) was taken at Alt Fiction, also in 2008 (Alt Fiction was a one day convention held in Derby).